With more than 3,145 water samples tested, DMPS is working to maintain safe drinking water at all schools. A top priority at Des Moines Public Schools is the safety and well-being of our students and staff. With national attention and awareness about lead in drinking water, including reports of elevated levels of lead in school drinking water around the country, DMPS has taken steps to determine if this is an issue in Des Moines and to ensure safe drinking water in our schools. In April 2016, DMPS began a program to monitor lead levels in school drinking water by working with both an outside testing laboratory as well as Des Moines Water Works. This was the start of regular testing of water in all school buildings. This initiative began with an initial building screening. The screening began with the collection of samples from hallway drinking fountains, kitchens, nurses’ offices, and selected classrooms throughout all of the district’s school buildings. Following the initial building screening, sample results were evaluated to determine appropriate response actions. 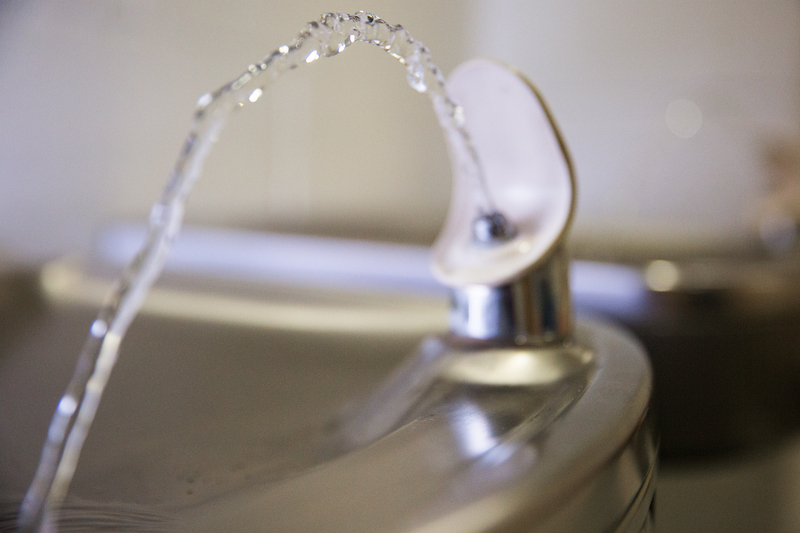 If lead levels above 15 parts per billion (ppb) were found in any school building, the district implemented corrective actions to reduce lead from the building’s drinking water based upon steps recommended by health and environmental experts. This included steps such as replacing equipment or regularly flushing drinking fountains and sinks. DMPS has taken corrective action based on initial testing data and follow-up samples. DMPS has implemented a plan to regularly test the drinking water at all schools. While such testing is not required by law, DMPS is taking this action to further ensure a healthy environment in our schools. Test results have been received for over 3,145 samples. Sampling data is available upon request. Please refer to the sections below for testing information from each DMPS school building, the district’s lead in drinking water management plan, and links to additional information about lead and drinking water. AGRICULTURE LABORATORY 201 SW County Line Rd. Nov. 2016 0 No further action required at this time. AVIATION LABORATORY 201 County Line Rd. July 2016 0 No further action required at this time. BRODY MIDDLE SCHOOL 2501 Park Ave. Nov. 2016 0 No further action required at this time. BRUBAKER ELEMENTARY 2900 E 42nd St. July 2016 0 No further action required at this time. CALLANAN MIDDLE SCHOOL 3010 Center St. July 2016 0 No further action required at this time. CAPITOL VIEW ELEMENTARY 320 E 16th St. July 2016 0 No further action required at this time. CARVER ELEMENTARY 705 E University Ave. July 2016 0 No further action required at this time. CATTELL ELEMENTARY 3101 E 12th St. Dec. 2018 0 No further action required at this time. CENTRAL ACADEMY 1912 Grand Ave. July 2016 0 No further action required at this time. samples taken at 1800 Grand Ave. 1800 Grand Ave. Aug, 2018 0 No further action required at this time. CENTRAL NUTRITION CENTER 1301 2nd Ave. Aug. 2018 0 No further action required at this time. COWLES MONTESSORI 6401 College Ave. Aug. 2018 0 No further action required at this time. DEAN AVENUE OPERATIONS CENTER 1917 Dean Ave. Dec. 2018 0 No further action required at this time. DOWNTOWN SCHOOL 1800 Grand Ave. Dec. 2017 0 No further action required at this time. EAST HIGH SCHOOL 815 E 13th St. July 2016 0 No further action required at this time. EAST HIGH SCHOOL ATHLETICS FACILITY 815 E 13th St. July 2016 0 No further action required at this time. EDMUNDS ELEMENTARY 950 15th St. July 2016 0 No further action required at this time. FINDLEY ELEMENTARY 3025 Oxford St. Dec. 2018 0 No further action required at this time. FLEUR DRIVE ADMIN. 2100 Fleur Dr. Apr. 2016 0 No further action required at this time. GARTON ELEMENTARY 2820 E 24th St. Mar. 2018 0 No further action required at this time. GOODRELL MIDDLE SCHOOL 3300 E 29th St. Nov. 2016 0 No further action required at this time. GRAND AVENUE ADMIN. 2323 Grand Ave. Nov. 2017 0 No further action required at this time. GREENWOOD ELEMENTARY 316 37th St. Nov. 2017 0 No further action required at this time. HANAWALT ELEMENTARY 225 56th St. Oct. 2018 0 No further action required at this time. HARDING MIDDLE SCHOOL 203 E Euclid Ave. July 2016 0 No further action required at this time. HIATT MIDDLE SCHOOL 1430 E University Ave. July 2016 0 No further action required at this time. HILLIS ELEMENTARY 2401 56th St. Dec. 2017 0 No further action required at this time. HOOVER HIGH SCHOOL 4800 Aurora Ave. April 2016 0 No further action required at this time. HOOVER HIGH SCHOOL ATHLETICS April 2016 0 No further action required at this time. HOWE ELEMENTARY 2900 Indianola Ave. July 2016 0 No further action required at this time. HOYT MIDDLE SCHOOL 2700 E 42nd St. July 2016 0 No further action required at this time. HUBBELL ELEMENTARY 800 42nd St. Oct. 2018 0 No further action required at this time. JACKSON ELEMENTARY 3825 Indianola Ave. Oct. 2018 0 No further action required at this time. JEFFERSON ELEMENTARY 2425 Watrous Ave. Aug. 2018 0 No further action required at this time. KING ELEMENTARY 1849 Forest Ave. Dec. 2018 0 No further action required at this time. LINCOLN HIGH SCHOOL 2600 SW 9th St. Nov. 2017 0 No further action required at this time. LINCOLN HIGH SCHOOL ATHLETICS FACILITY 2600 SW 9th St. June 2016 0 No further action required at this time. LINCOLN RAILS 1000 Porter Ave. Oct. 2018 0 No further action required at this time. LINCOLN RAILS ATHLETICS FACILITY 1000 Porter Ave. June 2016 0 No further action required at this time. LOVEJOY ELEMENTARY 801 E Kenyon Ave. Nov. 2016 0 No further action required at this time. MADISON ELEMENTARY 806 E Hoffman St. May 2018 0 No further action required at this time. MANN EDUCATION CENTER 1001 Amos Ave. Nov. 2017 0 No further action required at this time. McCOMBS MIDDLE SCHOOL 201 SW County Line Rd. July 2016 0 No further action required at this time. MCKEE EDUCATION CENTER 2116 E 39th Ct. Aug. 2016 0 No further action required at this time. McKINLEY ELEMENTARY 1610 SE 6th St. Oct. 2018 0 No further action required at this time. MEREDITH MIDDLE SCHOOL 4827 Madison Ave. July 2016 0 No further action required at this time. MERRILL MIDDLE SCHOOL 5301 Grand Ave. Oct. 2018 0 No further action required at this time. MITCHELL EARLY LEARNING CENTER 111 Porter Ave. July 2016 0 No further action required at this time. MONROE ELEMENTARY 3015 Francis Ave. Aug. 2016 0 No further action required at this time. MOORE ELEMENTARY 3716 50th St. Dec. 2017 0 No further action required at this time. MORRIS ELEMENTARY 1401 Geil Ave. Aug. 2016 0 No further action required at this time. MOULTON ELEMENTARY 1541 8th St. Dec. 2018 0 No further action required at this time. NORTH HIGH SCHOOL 501 Holcomb Ave. Dec. 2018 3 Restroom fixtures to be replaced, follow-up sampling to be completed. NORTH HIGH SCHOOL ATHLETICS FACILITY 501 Holcomb Ave. April 2016 0 No further action required at this time. PARK AVENUE ELEMENTARY 3141 SW 9th St. Nov. 2016 0 No further action required at this time. PERKINS ELEMENTARY 4301 College Ave. Oct. 2018 0 No further action required at this time. PHILLIPS ELEMENTARY 1701 Lay St. Nov. 2017 0 No further action required at this time. PLEASANT HILL ELEMENTARY 4801 E Oakwood Dr. Dec. 2018 0 No further action required at this time. PROSPECT ROAD FACILITY 1915 Prospect Rd. July 2016 0 No further action required at this time. RIVER WOODS ELEMENTARY 2929 SE 22nd St. July 2016 0 No further action required at this time. ROOSEVELT HIGH SCHOOL 4419 Center St. July 2016 0 No further action required at this time. RUBY VAN METER SCHOOL 710 28th St. July 2016 0 No further action required at this time. SAMUELSON ELEMENTARY 3929 Bel Aire Rd. June 2018 0 No further action required at this time. samples taken at 1800 Grand Ave. 1800 Grand Ave. Aug. 2018 0 No further action required at this time. SMOUSE OPPORTUNITY SCHOOL 2820 Center St. May 2018 0 No further action required at this time. SOUTH UNION ELEMENTARY 4201 South Union St. Nov. 2017 0 No further action required at this time. STOWE ELEMENTARY 1411 E 33rd St. Nov. 2017 0 No further action required at this time. STUDEBAKER ELEMENTARY 300 E County Line Rd. Nov. 2017 0 No further action required at this time. TAYLOR EDUCATION CENTER 1801 16th St. July 2016 0 No further action required at this time. WALKER STREET 1421 Walker Street July 2016 0 No further action required at this time. WALNUT STREET SCHOOL 901 Walnut St. May 2018 1 Restroom fixture replaced, laboratory results pending. WEEKS MIDDLE SCHOOL 901 E Park Ave. July 2016 0 No further action required at this time. WILLARD ELEMENTARY 2941 Dean Ave. Dec. 2018 0 No further action required at this time. WINDSOR ELEMENTARY 5912 University Ave. Aug. 2016 0 No further action required at this time. WOODLAWN EDUCATION CENTER 4000 Lower Beaver Rd. Nov. 2017 0 No further action required at this time. WRIGHT ELEMENTARY 5001 SW 14th St. Aug. 2016 0 No further action required at this time. NOTE: Sampling data is available upon request. Gather the initial sample and test results. All results less than 15 parts per billion (ppb): no further action is required until the next scheduled testing. If there are any results from a building with a concentration more than 15 ppb, a flush sample will be collected and tested from every location with an initial test result greater than 15 ppb. If results of the second sample are less than 15 ppb, corrective actions will be implemented which may include, but are not limited to: fixture replacement; termination of service to a fixture; implementation of a fixture-flushing program; and completion of a full-building drinking water survey. If results of the flush sample are greater than 15 ppb, corrective actions will be implemented and follow-up sampling will be completed to confirm effectiveness of the measures taken. A full-building drinking water survey will be completed. Click here to read about the DMPS Water Monitoring Action Plan. NOTE: Schedule is subject to change based upon programming and sampling results. Des Moines Water Works: DMWW is the provider of water service to all school district facilities. Their web site includes information about how Des Moines works to reduce lead in drinking water as well as suggestions on how to reduce exposure to elevated levels of lead. U.S. Centers for Disease Control and Prevention: The CDC offers information about the health effects of lead as well as tips on how to reduce and avoid exposure. U.S. Environmental Protection Agency: The EPA provides a wide range of information about lead in water supplies along with advice on how to reduce and avoid exposure.